Published to commemorate the bicentennial of Thomas Paine's death, these texts have remained two of the most influential arguments for liberty in political thought. Common Sense is a pamphlet that Paine wrote in support of American independence. Thanks to its original and simple style, it spread like wildfire through the colonies, helping to inspire the American Revolution. Rights of Man is Paine's passionate defence of the French Revolution that led to his trial for sedition and libel. 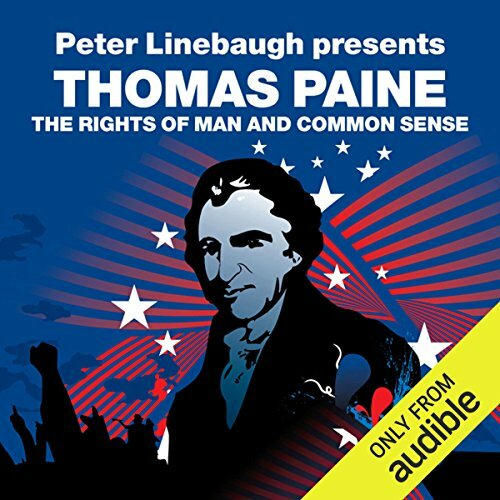 Acclaimed historian Peter Linebaugh reveals the continued significance of Paine's thought and legacy for our understanding of today's world. would suggest reading it for yourself before trying to listen to 14 hours of monotone ear bleeding boredom. no offense just really did not love it. Thomas Paine’s words illuminated the world in which America was born and gave inspiration to the men and women that came from Europe to this new land. Its described some aspects of the political landscape of the time in England, France and America. The reading (listening) of these works shared light about the French Revolution and its implications. One also had a better understanding of the disputes involving Paine and Edmund Burke. Above all, these books presented Paine’s argument for equality in a world of established social hierarchies. This is the mindset of our founding fathers when they were creating this country. It's time we return to those principals on which or constitution was based.